All year long we've been asking people in every phase of the software development lifecycle to tell us what quality means to them. We found that while most agree on what quality is, there's still controversy over how to achieve it. 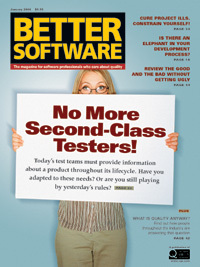 Turn to The Last Word, where software professionals who care about quality give you their own opinions on hot topics. Find out what Peter Clark really thinks about overtime and why Lance Armstrong may hold the secret to success. Need a place to go to get the solutions you’ve been craving? Management Fix is what you’ve been looking for. In this issue, find out what to do when an employee who has historically performed well has a dry spell. What if someone told you that the cure for project woes was to throw due dates out the window, stop doing so much, and embrace uncertainty? Is this a radical treatment or just snake oil? The theory of constraints says it will work. Frank Patrick will show you how. We make software so that people can use it. Yet these users are so hard to define that they are often simply ignored. This six-step approach to Interaction Design can help you bring your customers down to size so that you can provide the right product for them. Today's quality professionals should be more than bug finders—they should be an integral part of the development process, supplying product information throughout the application lifecycle, from requirements to release. Learn how you can be sure that your test team is diverse and skilled enough to meet these challenges.